The Angle System for branding offers simplicity, universal application, and the need for only two branding irons to make any number. The Angle System (also called the International Alpha Angle System) was developed by Dr. R. Keith Farrell at Washington State University in the 1960s. 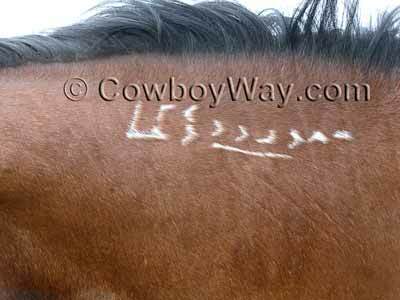 It is commonly used when freeze branding horses. Perhaps the Angle System is best recognized in the United States as the system used by the United States Bureau of Land Management (BLM) for freeze branding BLM horses, aka "mustangs". As mentioned above the Angle System offers simplicity, and needs only two branding irons to make any number. When using this system to freeze brand BLM horses the brand is located on the left side of the neck. You might also like: Pictures of mustang horses. Here are the symbols used in the angle brand system. The numbers shown (1, 2, 3, etc.) are NOT part of the system; only the double bars and right angle symbols are used. We put the numbers next to each symbol so you can easily see which number each symbol represents. Commonly, when using the angle system to freeze brand horses the horse's year of birth is shown first by using the last 2 digits of the year the horse was born, stacked on top of each other. The numbers following the year of birth are a unique number series used to identify an individual horse. The "02" is the year the horse was born. The "9 8 5 6 7 4" is a unique number assigned to a particular horse. The angle brand system is used to brand United States Bureau of Land Management (BLM) horses (aka "mustangs"). When the BLM uses this system, they place the brand on the left side of the horse's neck, and add an extra symbol at the beginning of the brand, in front of the year the horse was born, to indicate the brand is registered with the United States Government. A bar is also placed under all or part of the numbers after the year. The bar underneath the numbers acts as a guideline indicating where the actual bottom of each character is. This "true bottom" guideline can be helpful when reading brands on horses whose necks have arched or dipped due to the horse gaining weight, losing weight, aging, etc., since they were branded. Photo of an actual BLM freeze brand. The last character on this brand is difficult to read. Trimming the hairs can sometimes make difficult-to-read characters easier to understand.